Completed in 1846, the Lighthouse was manned until 1984 when automation meant that the keepers were no longer required and the switching on and off of the lamp could be done remotely from the Northern Lighthouse Board headquarters in Edinburgh. With the advent of new technology, the addition of a North Cardinal Buoy next to the Halliman Skerries allowed the lamp to be switched off in 2012. Access to the lighthouse was always at the discretion of the lighthouse keepers and as such there was never general access to the tower fot the public. With the support of the local community there was a desire to get this wonderful building into public hands. 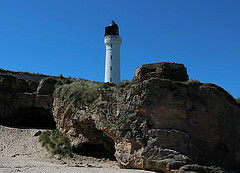 The Lossiemouth Business Association helped form the Covesea Lighthouse Community Company Ltd, which was established to buy the property, with the intention of getting it open to the public for the first time. With the support of government funding the lighthouse was bought in 2013.